National Elite Hockey - Why National Elite Hockey Development? Why National Elite Hockey Development? 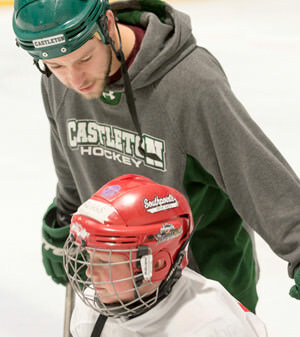 Many youth hockey training programs will teach you how to skate, shoot, pass and stickhandle. Very few of these programs actually develop hockey players. The reason is twofold. First, the player develops these individual skills but fails to recognize how to correctly utilize them in a game situation. Second, their play without the puck (getting open for a pass, being ready to receive a pass, how to read off a teammate, how to defend, how to react from a change of possession, etc.) is poor. National Elite Hockey Development keys on these two aspects, along with proper technique of individual skills. Mix in some hard work and discipline and it is easy to see why we separate ourselves from the pack. We at National Elite Hockey Development feel it is our duty to our players to teach the right, not the easy, way to play the game. We pride ourselves with providing the best staff in the area, who are dedicated to teaching our philosophy to aspiring players. Coaches will be committed to giving the players constant feedback and correction. Kids will be constantly moving and thinking during their time with us. Players will be put in a challenging environment where they will be expected to perform each repetition with maximum attention to detail. Players want coaches that are serious about getting them better and are invested in them as people. The fun of improving will keep the players motivated. We won’t make any claims that your player will make the NHL if they come to us. We have seen, however, through our many years in the business that players will improve using our programs if they fully invest themselves. More importantly, they will develop skills that will translate to their days after hockey. Ready to take your game to the next level with National Elite Hockey Development?